I ventured into new territory in Kuwait on Saturday…No, it wasn’t the towers, nor was it the museum or even the aquarium. I FINALLY managed to see…The INSIDE of my oven!!! It was dusty which isn’t a surprise, hahaha! Neither my flatmate nor I have used it since we moved in to our apartment at the beginning of October. In Canada, December is a time I’m busy baking in preparation for Christmas. For the past few years, my sister and I took over most of the Christmas baking duties as my mother’s health continued to deteriorate. 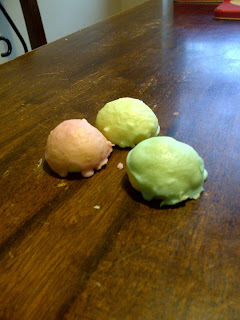 My sister now makes the genettis (Italian cookies that my mom learned to make from her mom who learned of the recipe from Italian families in their neighbourhood), and fruit jumbles (another one of my grandmother’s traditional Christmas cookies. They’re like mini Christmas cake-yeah, the Christmas cake that no one ever eats). What else does my sister usually bake??? Ohhh, I remember! She usually makes the skittles which are homemade nuts and bolts. I THINK we got this recipe from a long-time family friend, Lorrie. A few years before she passed away, my mother began a new tradition of baking something new every year. The new treat never stays in our traditional Christmas baking repertoire, but it’s fun to do! This would be the time of year when I would normally be baking ginger molasses cookies, my Uncle Jeff’s shortbread cookies (even though he IS of Scottish descent, he got the recipe from a co-worker), and kaka cookies. I believe “kaka” cookies are better known as porcupine cookies. Emi called them kaka cookies because they look like…Well, they look like…Poop. I’m sorry, there is no nice way of putting it without either sounding crass, like a 3-year old, or like a scientist. Since I’m NOT in Canada, and I don’t have a hand mixer/blender, I made drop cookies. In my quest for anything pumpkin flavoured, my flatmate found canned pumpkin and today I finally got the courage to try baking with it. What took me so long, you ask? Well, let me tell you: We have a gas oven. Yes, you can laugh at me. Unlike my Polish flatmate who grew up in a rural area in Communist Poland, I grew up in an ever-growing city in not-Communist Canada. I never even knew how to use a gas stove until I moved into this flat-watch that you don’t burn yourself, Mik! I’ve been so sheltered. I can’t even make rice in a pot! I have a high-tech rice cooker from Japan. My flatmate had to help me light the oven and then figure out what heat level would bake, but not burn, the cookies. Honestly? I still burned the first darn batch, as I do EVERY year. My sister sent me some pictures of the baking she’s already done. She told me that the icing sugar that she used on the genettis was so clumpy…It does look thin, but I know they taste awesome! 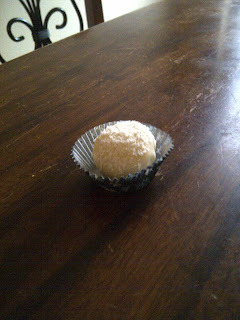 She also sent me a picture of a truffle she made and it looks so tasty! Apparently, my father keeps eating them. At this rate, there won’t be any left for Christmas! That’s my dad though: Mik’s dad + chocolate = the inhalation of the chocolate. My father’s sweet tooth is equivalent to mine and my sister’s (and my mother’s when she was alive). He’s a big fan of Ferrero Rocher chocolates. We always buy him a large box of them at Christmas and he’ll hide them from us! Sometimes he’s such a kid. We all open our chocolates, pass them around (Emi gets Toffifee, and I usually get Turtles or Almond Roca. My mom loved the Laura Secord French & frosted mint chocolates), and then we can put them away, but the rule is that if we open them then we have to share them. Not dad though. He opens his, eats five in the time it takes me to eat one of mine, then he runs off to hide his chocolates. Uh, dad? You hide your Ferrero Rocher in your closet EVERY year. Maybe it’s time to find a new hiding spot? P.S. I can control myself. I usually only steal one or two of his chocolates, hahaha! The holidays are upon us here in Kuwait, too! I baked two batches of pumpkin cookies with caramel frosting (pictured below). I gave some to our hares (building manager) and he really liked them. My flatmate, who also has a sweet tooth, has eaten quite a few today. I love seeing people smile and I love making people happy with food that I make! For secret Santa, I’m going to make my flatmate a homemade hot chocolate mix complete with chunks of chocolate bars and marshmallows!!! I’m VERY excited and hope she likes it!!! Keeping on the topic of hot chocolate, when I was in Salmiya with the Irish chef yesterday, I replenished my mint hot chocolate stash. I also found something I didn’t expect to find: JAPANESE CURRY!!! I had to buy some! I’m not sure how other expats feel when they live abroad, but I find that there are some things from home that I really miss and crave and other things I can gladly forget about (like Nutella. People here are OBSESSED with Nutella. Sure, it's tasty, and although I like Nutella, I'm not nuts about it, ha!). I've always wondered what it means when, as an expat, I return to the familiar of home as opposed to embracing the challenge of trying to assimilate into the culture I'm living in by either finding a substitute or just living without whatever it is that I need/want/miss/etc....However, that's a question for a whole other blog post, lol! Mint hot chocolate (I love ANYTHING with mint AND chocolate!) & Japanese curry! *Addendum: The recipe for the pumpkin spice cookies with caramel frosting is posted below in the comment section. WARNING: You cannot purchase nutmeg in Kuwait...Apparently it can be used as a narcotic. I probably should have known that. Please reply and include pictures if you try making the cookies! Aren't you worried that your flatmate will read your blog and discover that you are his/her secret Santa? :-) btw, those pumkin cookies with the caramel frosting look delicious. Would you mind posting the recipe? Haha, yeah I have no idea what the deal is with nutria over here. It's yum, but not something that I would get obsessed over. Lol. layla: My flatmate doesn't know I blog, nor do my other co-workers, which is why I chose not to use their real names. As for the cookies, they ARE delicious! Although, I actually really enjoyed the caramel without the icing sugar added, but I have no idea how you would ice the cookies if you don't add the icing sugar. -in large mixing bowl mix butter, brown sugar and white sugar and mix with a whisk or hand mixer. -then add egg and vanilla extract and mix. -add pumpkin and mix with a spoon. -in separate bowl, mix flour, baking soda, nutmeg, cloves, ginger, salt and cinnamon with a spoon. -combine wet and dry ingredients. -drop spoonfuls of dough on lightly greased baking/cookie sheet. -combine butter, heavy cream and brown sugar in a saucepan and bring to a slow/rolling boil (DON'T BURN!). -once mixture is COMPLETELY cool, add confectioner's sugar and vanilla. Layla: No need to thank. I hope you enjoy them :) Please post a picture, too, if you can!!! Sounds wonderful. It sure is an adventure cooking in a country that restricts ingredients. I'm still trying to cope with the lack of rice wine and now Nutmeg???? really. There are some odd restrictions. I understand the basis but there seems to be a lack of understanding about some ingredients. I do wonder how to make a narcotic out of nutmeg.. good old google I will have to see. We are experiencing a green Christmas so far but a beach would just top it off. As far as the gas oven goes I have one that is not hooked up and I miss it terribly. Be prepared when you get back you will notice a huge difference. Still up for a skype chat? Leah: Yes, I'm SOOO up for a skype chat! I can't use my webcam (my internet is rubbish), but I can chat online! yayaya!!! when are you free??? Hey Leah, do you mind me asking where you live? I just can't imagine a country that would ban nutmeg!! Hi Layla: I think Leah is referring to me...I'm not sure. You can't get rice wine or nutmeg in Kuwait. what do you do when a recipe calls for something that is banned? I just skip to the next recipe for fear of trying it out without the item and totally failing. btw, nutmeg is available in kuwait! try the small bakalas.. there's one right next to my house that sells whole nutmeg. There's a funny story about that if you have time. I've never used whole nutmeg before and didn't know that you're supposed to use the seed inside. I spent at least 1/2 an hour trying to grate the hard outside shell and was wondering why it was so hard to do when Nigella Lawson would do it in like 30 seconds! You found nutmeg? Thank you for letting me know! I'll see if I can find some when I'm in the (traditional) Souq this weekend :) How do you break the hard outer shell of nutmeg, I wonder. Please share your stories! I'm sure readers would love to read about other expats' experiences! Layla, Im in Canada Im referring to Miki-chan. She keeps running into these little challenges. But now I am understanding why some speciality stores certain ingrediants never appear on the shelves. Like Oregano and Basil at an asian store. Hey Babe - I enjoy reading your blog - it's a delightful diversion from my busy day - for some reason it also makes me hungry! Uncle Jeff!!! I'm glad you that you enjoy reading my blabber, lol! Yeah, the food pictures even make me hungry sometimes! Kuwait has begun to warm up during the day, although the evenings are still cool. -38??? Yuck. I AM thankful for the warm weather in Kuwait :) Love you and miss you, too, Uncle Jeff! See you soon!! !